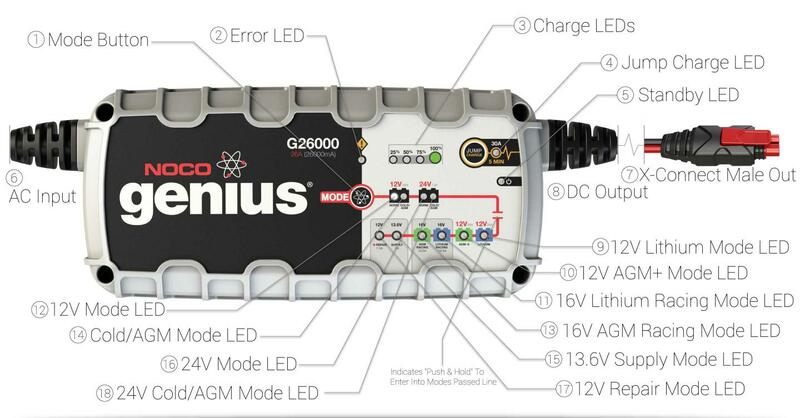 Read below for an overview on the G26000 Smart Charger. The Standby LED light indicates that the charger is in standby mode. No charging is happening when this light is illuminated. The 12V AGM+ Mode LED indicates that the charger is in 12V AGM+ mode. This is for advanced AGM batteries that require a higher than normal charging voltage. The 16V Lithium Racing Mode LED indicates that the charger is in 16V lithium racing mode. This type of battery is used in vehicles that require massive amounts of electricity in a very short time period, such as tuned vehicles and race cars. Check your battery before using this mode.